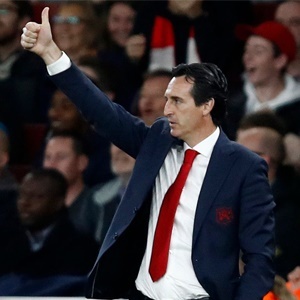 Cape Town - Unai Emery was left ruing dropped points as Arsenal were held to a 2-2 draw with Manchester United at Old Trafford on Wednesday. Shkodran Mustafi opened the scoring with a diving header that David de Gea was unable to keep out before an immediate response from Anthony Martial at the other end. A Marcus Rojo own-goal then put Arsenal ahead for the second time, only for Jesse Lingard to poke home an equaliser following the restart. After the game, Emery said: "I am very proud for our work and how we responded in the 90 minutes. When we are winning it was a good moment, but they equalised very quickly then we got up after their two goals. "In the second half, our players worked to find a way to win. I think we were close, more than them, to do the third goal but De Gea saved two or three times with good action." Emery added that he was concerned with an injury sustained by defender Rob Holding, who was stretchered off before half-time. Aaron Ramsey was also withdrawn, but his injury is not as serious. The Arsenal boss added: "It's the worst news for us today. We are going to wait for the doctor but maybe it's a big injury with his knee. "Aaron Ramsey is a small injury but after these two injuries, every player responded with good commitment and good mentality to keep in the difficult moments our performance in the game."